Every alien that lands on this planet is searching for something else. 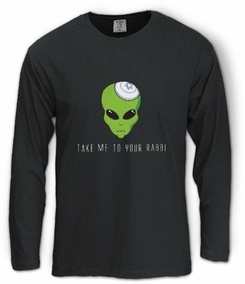 This Alien is seeking his Rabbi. We hope that he won't teleport him as well? Our t-shirts are made of 100% cotton and are long lasting with bright colors. Our products are all designed and printed in Israel.